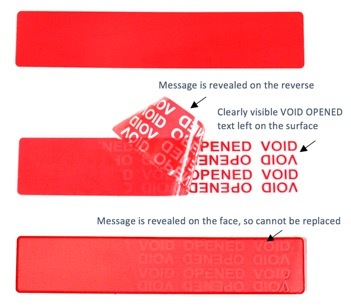 Permanent self adhesive tamper evident labels from Tamper Technologies deliver an instant, flexible additional layer of security. These labels offer an advanced tamper evident solution with a high contrast matt finish which gives an excellent void and a surface that can be written on in biro. Protecting your products and packaging from tampering, unauthorised opening and counterfeiting. Our labels are used on many surfaces and for many applications large and small – delivering a cost effective, critical tool to add to your security. These easy to apply permanent labels from Tampertech can offer another dimension to your brand through logos, slogans and colors – even hidden messages in the VOID message, your customers can simply peel and reveal a message from you.